As you may have already read the blog post from Eike Hein about Building on new pillars: Activities and KPeople in Plasma 5.3, activities can provide the useful information about the recent applications and resources used by them. 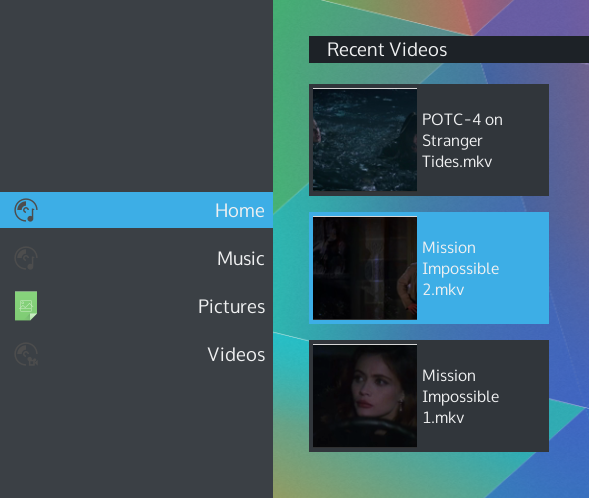 Plasma Media Center is going to use this awesome functionality of activities and will show recently opened media files from current activity in the Home screen of Plasma Media Center. This feature will be available in The Plasma 5.4 release. Also Plasma Media Center will report the information about recently played media to activities so, task manager and kicker application menu will be able to map recent media files to Plasma Media Center. Main advantage of this activities storing information about recently used resources is applications will not have to do extra wiring to keep the track of the recent files. This information is shared between the different applications so other applications can reuse it.